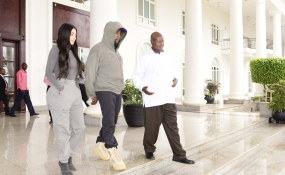 The controversial US rap artist, entrepreneur and self-acclaimed 'Ye', Kanye West has arrived Uganda for his music video. Some days ago he had announced that he will be visiting Africa to complete his album but at the time did not reveal which country he will visit. He reportedly arrived Uganda on Entebbe Airport on Friday 12 October 2018 and is booked in the exclusive Chobe Safari lodge in which he has completely taken over as other guests were asked to leave and their money refunded back to them sources say. He is accompanied by his wife Kim Kardashian West and children and is set to record his music video. Fans can only speculate if he will engage Ugandan artists to feature. According to TMZ, the couple plans to stay until 19 October 2018.